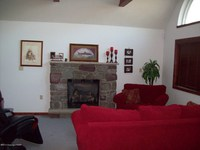 Rick's Pocono Blog: Newer Pocono Chalet Right Near The Beach! Not Your Typical Lakewood Chalet! 4 Bedrooms, 2 Bathrooms, Loft ,Radiant Tube Electric Baseboard Heat (Efficient) One Block to Lake, Propane Insert Stone Fireplace in Living Room ,15 x 12 Family Room, Large Front Deck, Quiet Maintenance Free Location! 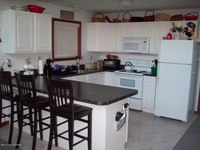 Priced Right at 189,900 for a 4 Bedroom 2 Bathroom Chalet. 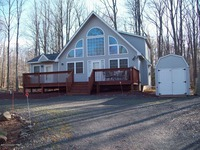 Only a Block from the lake in the Amenity Filled Pocono Favorite Community known as Arrowhead Lakes. Comes with A Master Bedroom on the first floor, Cable TV, Ceramic Wall to Wall Flooring, Stone Faced Fireplace in the Living Room, 24/7 Security, Washer, Dryer, Refrigerator, and Dishwasher.